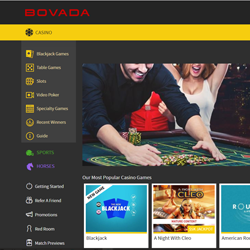 Bovada Casino is a comprehensive online gambling site offered by the makers of a highly popular online sportsbook, Bodog. Bovada Casino accepts US players, therefore their player base is much more diverse. Since there are only a few online casino that welcome US players, Bovada Casino enjoys great advantage. The brand was created by Calvin Ayre, a well known billionaire who appeared on the cover of Forbes’ magazine. New players can enjoy a three level welcome package of 100% max. $3,000, using the NEWWELCOME bonus code. The bonus money will prove extremely useful, as Bovada Casino has a wide selection of online and mobile casino games. RealTime Gaming, BetSoft and Rival Gaming software are used to power Bovada Casino. This a no-download casino so your computer won’t be thrashed by another program. The site is available on mobile as well, in its optimized version. Luckily, all devices are supported, therefore your on-the-go experience will be hassle free. 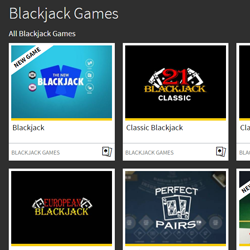 When it comes to blackjack, Bovada Casino offers only the basics. 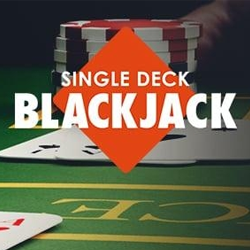 There are only eight blackjack titles to choose from: The New Blackjack, Classic Blackjack, Classic Single Deck Blackjack, Double Deck Blackjack, European Blackjack, Perfect Pairs, Single Deck Blackjack, and Zappit Blackjack. Bovada Casino offers a blackjack-related weekly casino bonus. Every 200 casino points collected playing blackjack from Friday to Sunday will translate to $10. You can collect up to $100 each weekend! Bovada Casino offers Casino Poker (including Carribbean Stud, Pai Gow, and Tri-Card Poker), Craps, Roulette (American and European), Baccarat, Perfect Pairs, Pontoon, Red Dog, Slot Machines with Progressive Jackpots, and many other games. Bovada Casino’s welcome package is very substantial. You can claim 100% up to $1,000 on your first three deposits. Just make sure to use the NEWWELCOME bonus code when depositing. Blackjack players can take advantage of the Weekly Blackjack Bonus. For every 200 casino point collected on Blackjack between Friday and Sunday, you’ll get $10, up to $100. Playing on-the-go is also profitable, as there’s a $10 mobile casino bonus to redeem. Last but not least, table game enthusiasts can win $10 on Tuesdays if they bet $250 on table games. 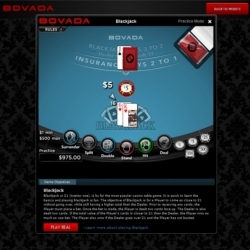 Bovada Casino is available to US players, which is a huge factor in their popularity. Their game selection is not the most wide ranging but they compensate that with generous bonuses. The site is available on every platform so it’s up your preference how you choose to visit the site.